We had made a decision this year to let our garden rest. We thought that if anything volunteered we could harvest from those plants. 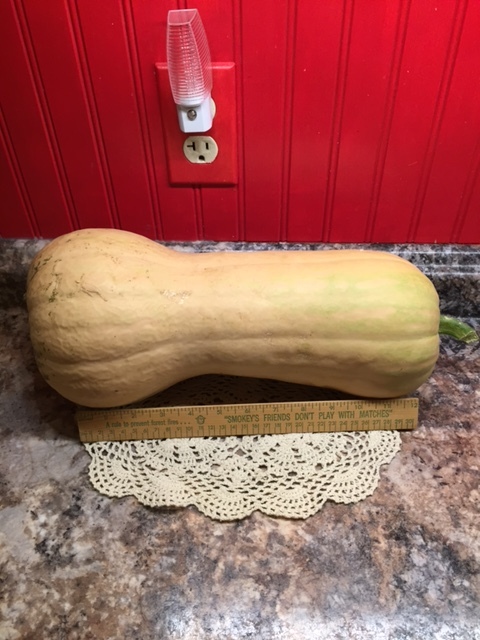 I was pleasantly surprised when we had a butternut squash begin to grow out of our compost pile that is directly behind our garden plot. It [the plant] loved the rich soil and took over more than half of my 15’x20′ garden! Say what?! I had to take a picture of one of them for you just get an idea of the magnitude of the size of the fruits that are coming from this plant. The ruler is below the fruit, measuring at more than a foot long. So, what to do with such a bountiful harvest of squash besides give them away? How about some healthy soup? I thought you might be looking for some easy recipes for days that you just want to have a crock pot recipe for those busy days. 1 quart chicken broth (or 4 cups), you can also use vegetable broth to make this vegetarian. 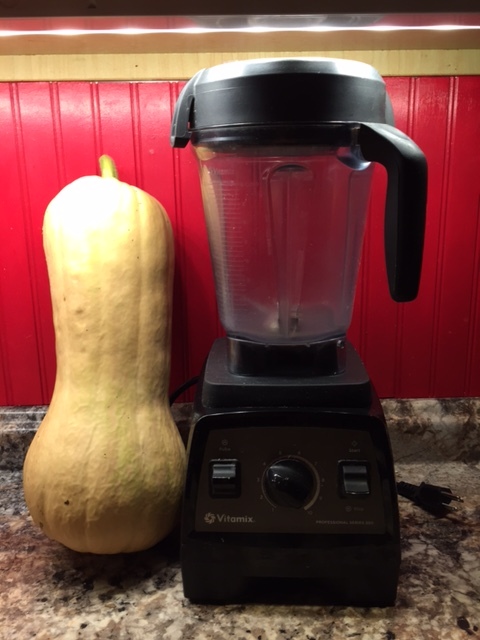 Also, depending on the size of your squash you might need more or less broth. 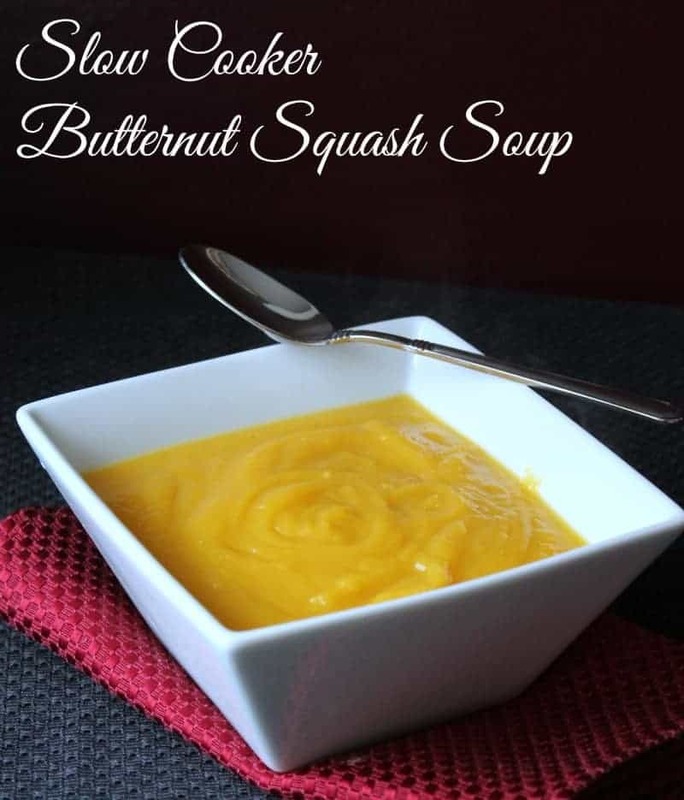 Place whole butternut squash and 2 tablespoons of water into the slow cooker. Put lid on and cook for 7-9 hours on low. Heat olive oil in a medium pan on high. Cook onions and garlic until translucent, about 7 minutes. Set aside. After the squash is done remove from the slow cooker, cut in half, remove the seeds and skin, and scoop out the flesh and place it back into the slow cooker. Discard the seeds and skin. Pour the onion mixture and chicken broth in with the squash. Using a hand blender, blend the ingredients until blended and smooth. Cook on high for another hour. Add salt and pepper to taste. Serve with a sprinkle of parmesan cheese. This soup can be made completely ahead of time and frozen into individual servings for easy lunches and dinners. Reheat on the stove or in microwave. Thank you for the recipe. Butternut squash soup is fall favorite. 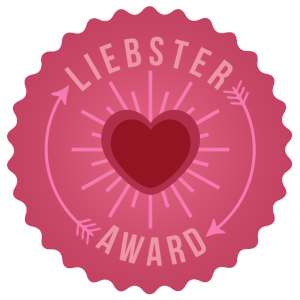 Congratulations on your harvest!